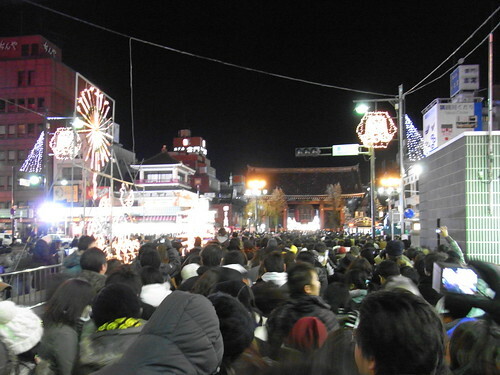 On new years eve we went and queued up at Sensoji temple in Asakusa. It is custom for Japanese to visit a temple to pray on the first day of the new year. And we though it would be interesting to go along and look while in Japan. It was very cold. But the crowd was friendly and well behaved. No drunken behaviour. Little to no pushing or shoving (until just inside the temple). A different evening to one you might encounter in Sydney, Australia. While we didn’t get to see any fireworks (they aren’t a feature of Japanese new years celebrations), there was a lively atmosphere. And lots of interesting food to try once you left the temple. This entry was posted in Photos, Travel and tagged Asakusa, Japan, people, temple, Tokyo. Bookmark the permalink.